Safety / Seat belts / Why is it so important to use seat belts? The common belief that passengers can brace their weight with their hands in a minor collision is false. It is an established fact that seat belts provide good protection in accidents. Therefore wearing a seat belt is required by law in most countries. Properly worn seat belts hold the occupants in the best position for maximum protection ⇒ fig. 203. The seat belts are capable of absorbing much of the kinetic energy arising in a collision. Also they help to prevent uncontrolled movements which could lead to severe injuries, “Important safety instructions for using seat belts”. If they wear the seat belts correctly, the passengers benefit greatly from the ability of the belts to reduce the kinetic energy gradually. The front crumple zones and other passive safety features (such as the airbag system) are also designed to absorb the kinetic energy generated in a collision. Taken together, all these features reduce the forces acting on the occupants and consequently the risk of injury. Although these examples are based on a frontal collision, the physical principles involved are the same in other types of accidents and for vehicles with an airbag system. This is why it is so important to put on the seat belts before every trip – even when “just driving around the corner”. Ensure that your passengers wear their seat belts as well ⇒ . Properly worn seat belts have been shown to be an effective means of reducing the potential for injury and improving the chances of survival in a serious accident ⇒ page 195, “Forces acting in a collision”. For information on how children can travel safely in the car, “Points to remember if children are travelling in the car”. • Seat belts must be put on before every trip – even when driving in town. This also applies to the rear passengers (injury risk). • During pregnancy, women should always ensure they wear a seat belt. The best way to protect the unborn child is to protect the mother, “Wearing and adjusting the seat belts during pregnancy”. There are a number of safety points concerning the seat belts which you should remember. This will help to reduce the risk of injury in an accident. • The seat belts can only provide maximum protection if the seats are adjusted properly, “Seats and storage”. • To ensure proper protection, it is important to wear the seat belts in the correct position, “How to wear seat belts properly”. Ensure that the seat belts are worn exactly as recommended in this chapter. Belts which are not worn properly can increase the risk of injury in accidents considerably. • Do not allow the seat belt to become twisted or jammed, or to rub on any sharp edges. • Never allow two passengers (even children) to share the same seat belt. It is especially dangerous to place a seat belt over a child sitting on your lap. • Do not wear the belt over hard or fragile objects (such as glasses or pens, etc.) because this can cause injuries. • Loose, bulky clothing (such as an overcoat over a jacket) impairs the proper fit and function of the belts. • The belts must be kept clean, otherwise the retractors may not work properly, “Seat belts”. • The slot in the seat belt buckle must not be blocked with paper or other objects, as this can prevent the latch plate from engaging properly. • The latch plate of the belt must always be engaged in the correct buckle for that seat, otherwise the belt will not be fully effective. 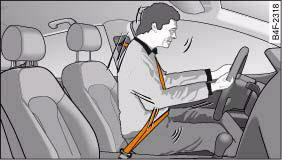 • Check the condition of the seat belts at regular intervals. If you notice that the belt webbing, fittings, retractor mechanism or buckle of any of the belts is damaged, the belt must be replaced by a qualified workshop. • The seat belts must not be removed or modified in any way. Do not attempt to repair a damaged belt yourself. • Seat belts which have been worn in an accident and stretched must be replaced by a qualified workshop. The belt anchorages should also be checked.